Most of you have heard about acupuncture, inserting thin needles in various points of the body. Based on the principles of Chinese medicine, inserting thin needles into various meridians lines and acupuncture points helps circulation, balance energy, and other ailments. A new trend, which I use trend loosely as acupuncture has been around for centuries is Cosmetic Acupuncture also know as Facial Acupuncture. 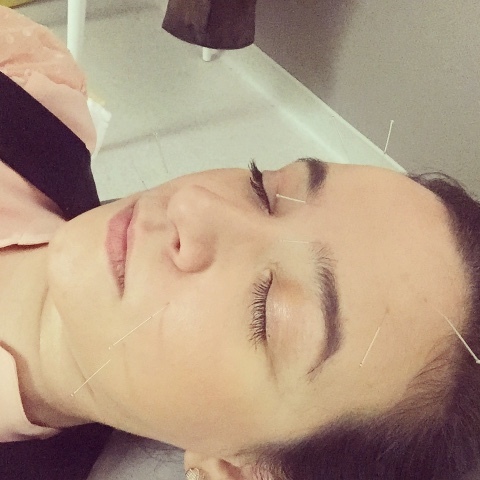 Facial acupuncture is an inexpensive and non-invasive treatment of reducing wrinkles and puffiness, increase circulation and blood flow also boost collagen. The results are endless! Depending on each individuals' concerns results will vary. I met Dr. Nekessa Remy last month and I'll be honest I didn't know what to expect as I had not researched too much about the procedure. Having had acupuncture in the past to treat migraines I was excited to try facial acupuncture. I think that we can all use a bit of a "boost" and facial acupuncture does exactly that without the pain of cosmetic surgery. Dr. Nekessa Remy, is a licensed chiropractor and medical acupuncturist who runs a clinic in Mississauga and downtown Toronto. I made my way to downtown Toronto to the Integra Health Centre, a new health centre located in the heart of the financial district which features a walk-in clinic. Facial acupuncture, is painless and can be done on your lunch break! Dr. Nekessa Remy explains that every facial acupuncture is different on everyone. For example for my treatment she used about ten needles but others might need more or less. How many sessions does facial acupuncture require? Again, depending on the individual from 9-12 sessions. Atleast once a week. Cost? Varies, as each individual requires different needs and amount of needles. In some cases your private health insurance may cover the costs. An initial consult with Dr. Nekessa Remy is required and the actual treatment does not take long, about half an hour. I have only done the one session and plan on going back. I really noticed a difference the following day. My skin looked well rested and healthier. I can only imagine after a full required treatment how I'd look!